Jancis Robinson MW has declared that all wines should be treated with equal respect and that just one wine glass will therefore suffice. The esteemed wine writer has teamed up with designer Richard Brendon to launch a glassware range called 1 Collection, which features two decanters and a water glass. 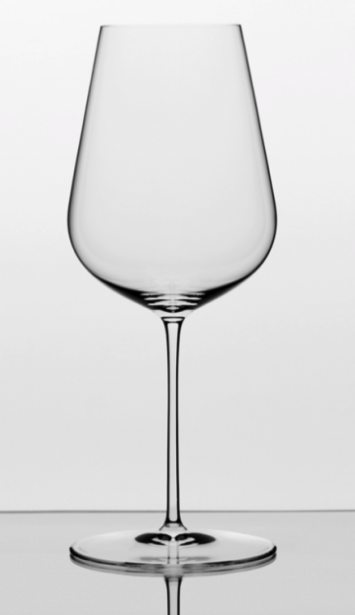 But there is just one wine glass in the collection and Robinson believes it is versatile enough to provide a worthy vessel for the lovely fermented grape juice that we are lucky enough to enjoy. She said: “Some people will think one glass is a bit odd, but I have never understood why white wine should be in a smaller glass than red. “Julia, my colleague, and I love white wine, it’s as complex as red, there’s no reason why it should be in a smaller glass, we certainly don't want to drink any less of it – and rosé as well – and there you have one rationale for one glass. “But people like Olivier Krug, who makes a fairly good sparkling wine, and I think Cherie [Briggs, chief winemaker at Nyetimber] would agree, is fed up with seeing their Champagne in tiny little glasses, or splodged into very wide ones, and just wants it to be appreciated as a wine, in a wine glass. Brendon has built up a reputation as one of Britain’s most prominent designers of bone china tableware, handmade in Stoke on Trent, marrying heritage craftsmanship with contemporary design. He launched his brand in 2013 and said wine glasses were “the next logical step for me”. “I’d been wanting to do it for ages, I had the right people to make them, I knew I could probably make something that looked nice, but I knew I couldn’t do it by myself,” he said. An initial email exchange did not exactly go to plan, as Robinson’s response was “these are the major players and I like this about them, good luck”. But Brendon persisted, secured a meeting with her and convinced her to go into business with him. “Throughout that meeting it was very clear that Jancis and I were totally aligned in terms of quality, in terms of what the product should feel like, and Jancis in that meeting told me that there should only be one wine glass for every type of wine,” said Brendon. “This was just music to my ears, because I wanted to create an incredibly compact collection. “It was very different to what most people were doing. We got to work and Jancis explained to me exactly what needed to be in the collection, and I set to work. I started drawing, went back and forth, we did so many rounds of sampling, we worked with three different factories, and Jancis had the tough job of testing all the glasses. Robinson is equally pleased with the final product, which will enjoy an exclusive UK listing at Harrods until being rolled out in the autumn. “This is a very classical shape and it allows a standard pour to be maximum width,” she said. “Once you have tasted wine from a really gossamer thin glass, like the lovely Zaltas, you can’t go back. It’s slightly an assault on the senses to taste wine from anything thicker really. “But if it’s going to be this beautiful – and Richard has ensured it really is beautiful with his designers and shaping it from very rough sketches of mine – it has to be mouth-blown, hand-made, it has to be an artisan product, so it is not a mass market product, but we are very proud of it. A set of two wine glasses has an rrp of £70, while six glasses retails at £200 and the decanters are priced between £100 and £125.